Friend & Family Referrals are a Proven way to Leverage & Grow Your Practice Business. When you make it Fun, Exciting & Rewarding for Your Current Customers to Seek Out and Send You a New Customer, over 8% Will and Do Send You Referrals. 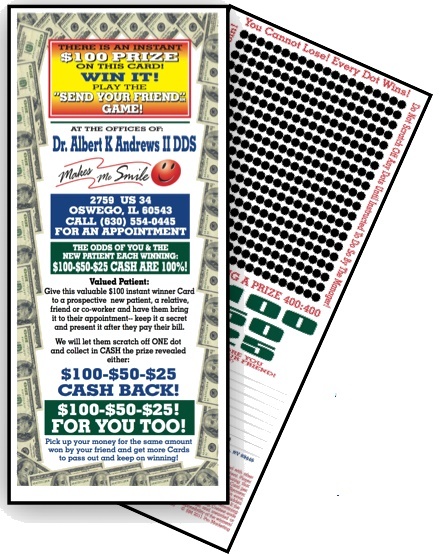 Our “Send Your Friend” Instant Game Cards have been a consistent hit in Auto Retailing for decades, and now we have a program Tailored for Dentists. Custom Color-Printed for your Practice, Tailored with your Logo, Contact Info & 3 Prize Amounts that you select (we suggest $250-100-50 -or- $100-50-25). Order 2,000 Custom Color Printed Rewards Cards Online and get Free Standard Shipping in US Mainland plus Free Setup & Free Art Proof. 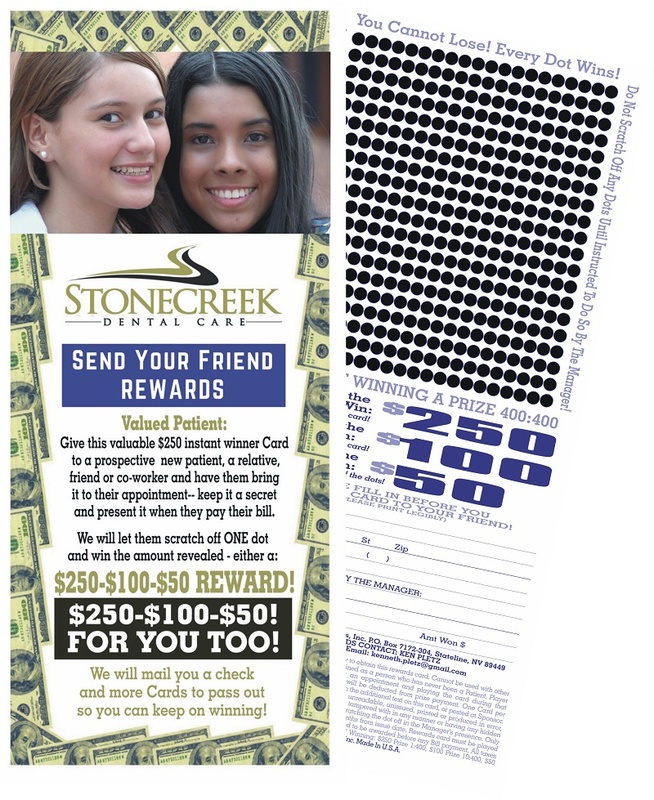 Provide All Current Patients with Your Scratch-Off Instant Win Rewards Cards. 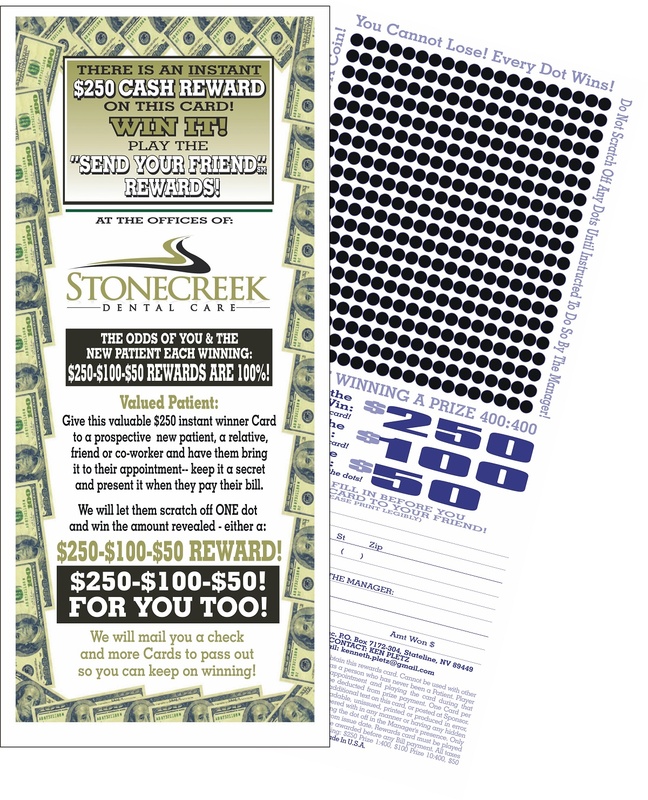 Distribute at the Office Front Desk and include with monthly mailed statements. 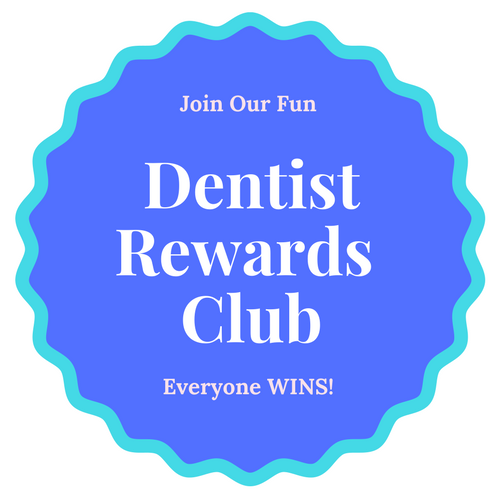 Encourage all Club Members to give one card to each of their Friends & Family who need Dental Services. All Your New Patients and Current Patient “bird-dogs” are guaranteed to win. 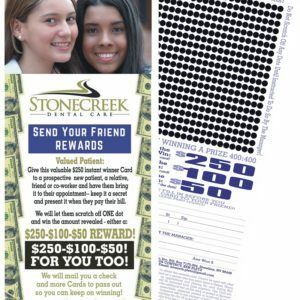 Have the New Patients Scratch-off at the Front Desk when they settle their bill. Give them Instant Credit in the Prize Amount on their bill. Friend & Family Referrals are a Proven way to Leverage & Grow Your Practice. Your Average Reward is only $56 each with the 250-100-50 Prize Lineup. You Pay After The New Patients come in…Give Them Credit on their Bill or Cash. 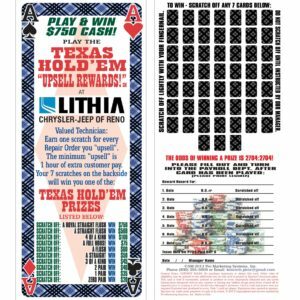 We will Custom Print your quantity 1000 or 2000 Send Your Friend Instant Game Cards, tailored with your Prize Amounts, Logo, Location, Tag Lines & more. Order Online and we include Free Standard Shipping in Mainland US along with Free Setup & Free Art Proof. Q: How Does The Dentist Rewards Club Program work? A: This Service Marked & Copyrighted “Send Your Friend” Game rewards both your New Patient and your Current Patient. The more people you give the card to with a smile–the bigger your referral universe. The bigger your universe the more referral Patients coming to your Practice. When the New Patient Pays their bill on the first visit, play the scratch-off card and credit them their winnings. And, also provide Credit to your Current Patient on their Account for Future Visits. Using an Incremental Probability Study we can project your average reward for both the current patient and the new patient friend they send. The WIN letters move to 400 new hidden image (under the dots) locations on every Game Card —this is the really hard part! No Two Game Cards have the same Reward locations!! Q: Do you offer International Language versions? A: Yes — Spanish, Chinese, Tagalog, Vietnamese and more languages are available. Q: Who is the Manufacturer ? 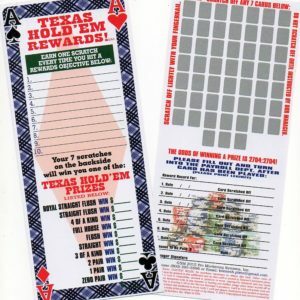 A: Pro Marketing Systems Inc. is the world’s largest manufacturer and marketer of Unseeded* Instant Winner Game Cards. Since 1993 we have developed and supplied our copyrighted Sales Contest / New Client Rewards Game Cards to over 5,000 satisfied business clients in US and abroad. 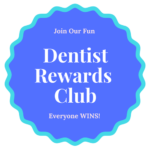 Contact us today to get your Rewards Program started next month~!